Tomatoes have a unique ability of forming adventitious roots or root initials on the main stem. These portions will start as warts ranging in a variety of colors and do not always mean your plants are in danger of dying. 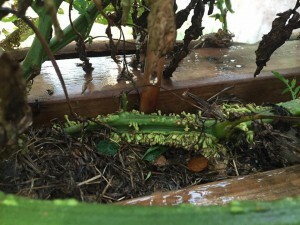 There are several reasons your plants might have started putting on these structures and there are ways that you can treat them. Adventitious roots are almost always a sign of some type of stress including high humidity environments, over watering or poor drainage, root damage, herbicide damage, and disease problems. Most of these are water issues that block the plant from accessing nutrients causing the plants to throw new roots in attempt to gain more nutrients or get out of oxygen deprived (Anaerobic) environments. When these root initials appear on the lower portion of the stem you can add soil or compost up to that level and the roots will take and strengthen the plant. If you have plants that have been in the pot that are showing signs of this you can plant them deeper when you transplant them. 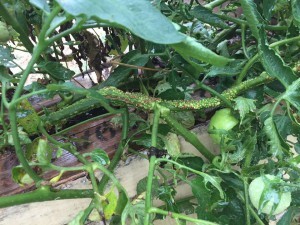 If you have tomatoes that have not been staked or are broken and lying down you will see that they will put on the same roots trying to anchor themselves in the ground as well as give a new passage way to gain nutrients. Anytime root initials appear on your plants continue looking for the reason they are there. If you see signs of wilting try adjusting watering frequency. Look for girdled stems, short-stunted plants, browning leaves which can all indicate root injury. In order to best prevent these from forming choose a site that is well drained. Also, only water when the plant needs it and try to refrain from over watering and keeping the site saturated. Remember that these structures are forming in response to a stress. If the stress is corrected these roots will strengthen the plant. Keep and eye out and do not panic because the tomato is surprisingly tough. Last updated July 12th, 2016. Technical problems, contact support.